OUR 15-PAGE CLAUSE CRUNCHER PORTFOLIO ($3.75) IS INCLUDED FREE OF CHARGE WITH THIS PACKAGE. Please use our Contact Page to request free sample pages before ordering complete PDF portfolios. A working knowledge of the five basic noun functions-subjects, predicate nominatives, direct objects, indirect objects, and objects of prepositions-and an awareness of the role these key elements play in the underlying structure of the English sentence is the foundation upon which full proficiency with the written and spoken forms of our language rests. 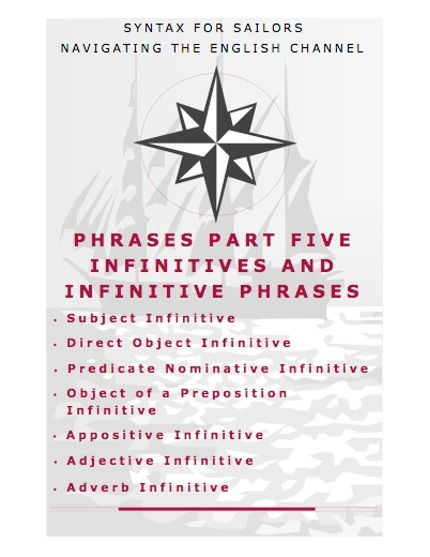 Add predicate adjectives to this mix and you have the basic building blocks of every English sentence pattern: subject-verb; subject-verb-direct object; subject-verb-predicate nominative; subject-verb-predicate adjective and subject-verb-indirect object-direct object. If you see this paragraph under a chapter cover sheet as shown here, you will not master its content until you've mastered the five noun uses. 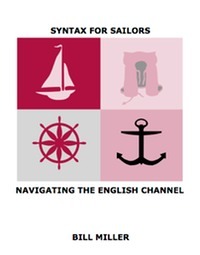 We strongly recommend using our exclusive Syntax For Sailors graphic pathway questioning process, The Clause Cruncher, to simplify this task and to improve comprehension significantly. The Clause Cruncher PDF Portfolio is included free of charge with chapters that introduce, stress, or maintain the five basic noun uses and the five basic English sentence patterns.